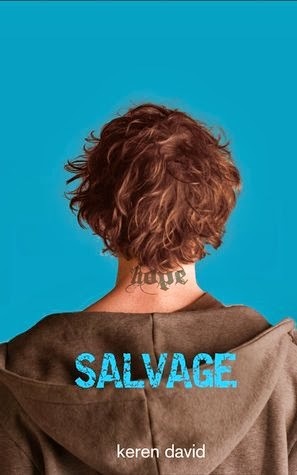 Salvage is typical Keren David gritty and raw with fabulous characters who you can't help but root for. I loved every page and struggled to put it down as I was desperate to know what was going to happen next. Salvage is the sorry of Cass and Aiden, siblings separated as young children when Cass was adopted and Aidan entered Foster Care. Years later they find one another on Facebook and get to know each other again. What I loved about this book was seeing Cass and Aiden discover one another again and come to terms with the very different upbringings the pair experienced. While Cass fell on her feet with wealthy parents, Aiden found himself moving from place to place never settling in one place for that long. Aiden's story particularly is utterly heartbreaking when you seeing the impact his early experiences has on him long term in his own confidence and in his interactions with those around him. I was utterly hooked to find out more about his story and background. All in all a fantastic and heartfelt story which I thoroughly enjoyed.